Tactical AR-15/M4/M4A1 Carbine Aftermarket Accessories for Military Combat Applications: The Competition-to-Combat Crossover, Part 3 | DefenseReview.com (DR): An online tactical technology and military defense technology magazine with particular focus on the latest and greatest tactical firearms news (tactical gun news), tactical gear news and tactical shooting news. Editor’s Note: This and previous articles written by Jeff Gurwitch for DefenseReview (DR) are the author’s (Gurwitch’s) SOLE OPINION, and are NOT endorsed by SOF, the U.S. Army or the U.S. Government. Another year, another deployment down! Time again for another update on Tactical AR-15 Aftermarket Accessories for Military Combat Applications: The Combat-to-Competition Crossover (Read Part 1 and Part 2 of this series). 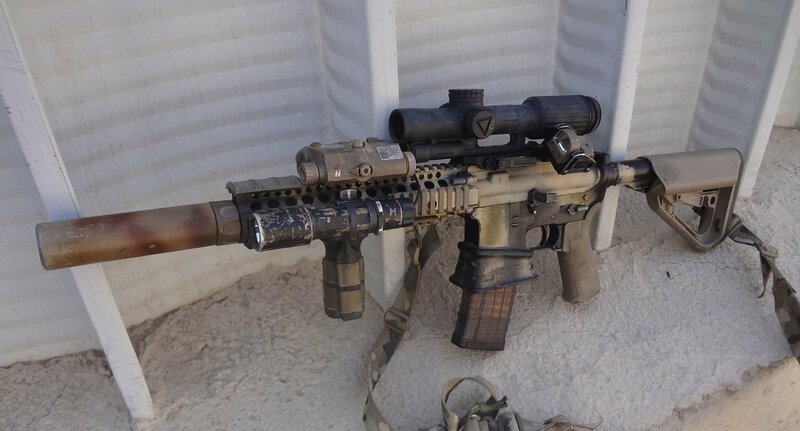 In the previous installment of this series (Part 2), I highlighted the benefit of using a Surefire SOCOM556-RC SOCOM Series Sound Suppressor (Silencer). This year, along with covering the most popular accessories being used, I’d also like to touch on the subject of combat optics for the fighting rifle/carbine/SBR (Short Barreled Rifle). The most prolific aftermarket accessories used on rifles are still made by Magpul Industries, the most popular items being their CTR stock (CTR Carbine Stock MIL-SPEC) and AFG’s (Angled Fore Grip). What makes Magpul so popular is, I believe, their middle-of-the-pack prices and solid quality. Despite what many might think, a lot of Soldiers aren’t necessarily “Gun guys”, unlike say a 3-Gun competitor who really takes the time to research, test and go for what they think is the best hardware to give them the winning edge in a match. For many soldiers, the rifle is just a tool. And, while they become very proficient using one, they’re not really dialed into the latest’s or coolest gun item. Instead, they look as far as what their fellow soldier’s using. If it seems solid, they go for some of the same items. I think this is the case with Magpul, solid kit at prices that won’t break the bank. 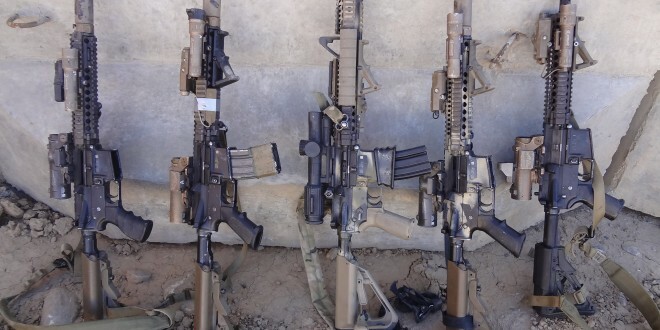 With the full implementation of SOPMOD block II program, SOF rifles are actually pretty up to date when compared to the most modern 3-Gun competitors’ rifles. 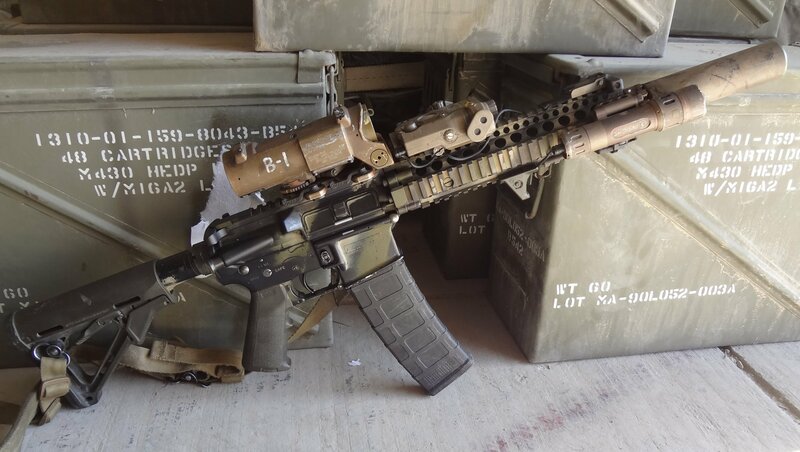 With both versions of the RIS II (front sight post and flat full rail) in use, and the adoption of Geissele Automatics two-stage match triggers, I wouldn’t feel at too much of a disadvantage using my issued M4A1 Carbine in a 3-Gun match instead of my civilian match “race rifle”. Really, the only thing missing would be a good compensator on the front of the rifle. 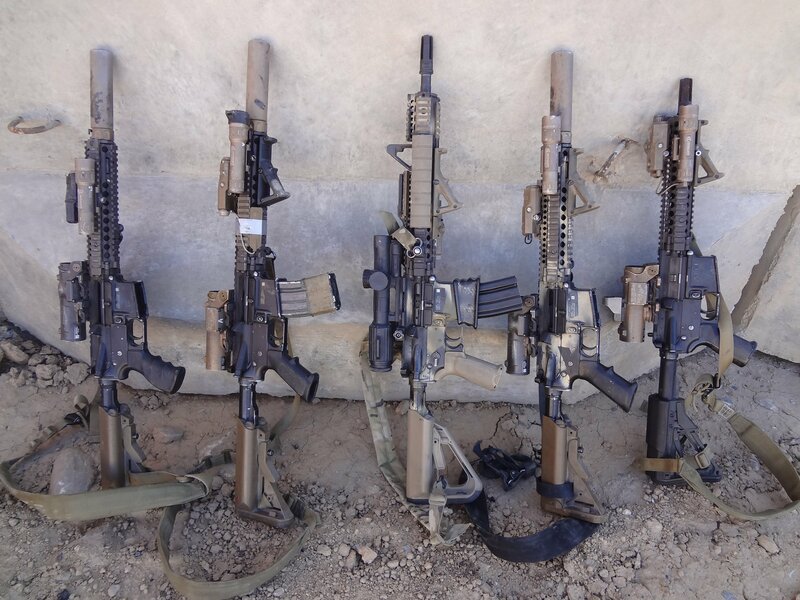 But, seeing how these are combat rifles, I find the Surefire 4-prong flash hider/suppressor ideal for controlling flash and, of course, mounting the issued SOCOM suppressor. While I find that the current updates to the M4A1 put it on par with the most current competitors’ set-up, one area I now find lacking are optics. For the longest time, I’ve found the Elcan Specter DR in 1-4 power totally acceptable and practical for the M4 in 5.56mm. The issue I have now is, in the civilian world, optics have moved on. Five years ago a semi-compact 1-4 power scope was the standard. Today, you can find a lot of very rugged and reliable 1-6 power scopes and even some 1.5 to 8 powers. Why would one need a more powerful optic with a 14.5″ (14.5-inch)-barreled 5.56 when most consider it to be a 500 meter gun? To help answer this question, I think it’s best to relate an experience I had while shooting the FNH 3-Gun match one year. At the time, I was using a Vortex 1-4-power scope on my AR. Now, I consider myself pretty well trained on a 4-power scope using both one at work (Elcan) and another in competition (at the time Vortex) as my primary optic. I felt pretty good as far as being able to do well in the match. During the courses of fire, there were two stages where shooters had to hit 6″ (6-inch) and 8″ (8-inch) plates from 200 out to 300 meters or so. During those stages, while I was able to hit those plates with my 4-power pretty fast, and went almost one for one on every shot, as it turned out, I was outpaced by a lot of other competitors. What had led me to getting beaten? Well, 1-6-power scopes had just hit the scene, and even though I had done well, I was outpaced by the shooters with more powerful optics. It’s that simple. The fact is, with more optical power, it’s easier to get on target faster, especially on small targets. Breaking down the match, shooting eight 6″ plates at 200 meters, I probably averaged four seconds from breaking the shot to shooting the next target with another clean hit. The shooters with 6-power scopes were easily cutting a second off their transitions to the next target. That equaled less time overall to shoot all eight plates. Well, 3-Gun is a game. How does that translate to tactical shooting? Easy. Look at a target at 400 meters with a 1-4-power Elcan. You can put the crosshair in the middle of the chest. Now look at that same target with a 6-power scope. Thanks to the extra magnification, you can put your crosshair on an exact spot on the chest or on the head much more assuredly. So, while I feel the 1-4 Elcan is a great combat proven optic it’s time to move on, for this reason alone. 7.62 rifles like the SCAR-Heavy come issued with 1-6-power Elcans with 7.62 BDC’s (Bullet Drop Compensating). I think it is time for the same thing for 5.56 guns. 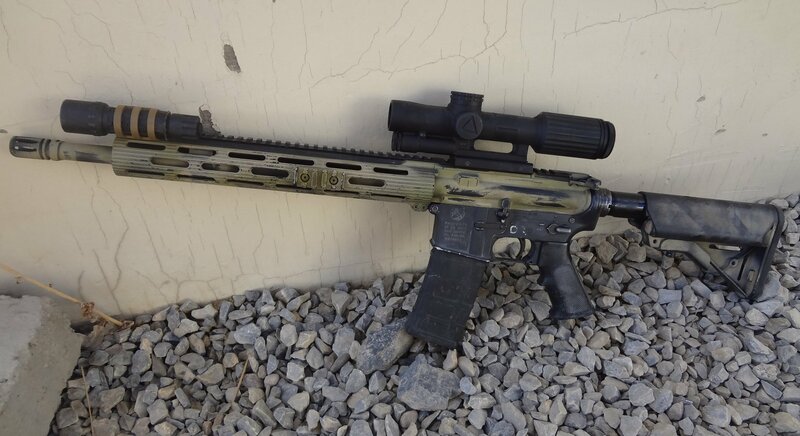 Rifle outfitted with a Troy Industries rail and most noticeably a Trijicon VCOG 1-6 scope (1-6×24 Variable Combat Optical Gunsight tactical rifle scope). Increased magnification not only allows shooter better chance of hitting far or partially exposed targets, but also works great in overall scanning areas for danger. Time to get to it! As I’ve already mentioned, this year Magpul again is the most popular choice for aftermarket accessories for rifles. One thing I would like to note is the placement of the LA5 laser on the rifle. Traditionally, most shooters placed their LA5’s forward on their forearms due to the previous limitations of the old PEQ2, and the belief that the front sight post would cause the IR (InfraRed) laser to be disrupted. If the IR laser wasn’t mounted as far forward as possible to clear it, you would have splash off your front sight post. This resulted in most shooters placing their LA5’s in the worst possible spot, in my opinion, right where their support hand needs to be for a strong C-clamp-style grip. Finally, as you will see in some of the set-ups, shooters have transitioned to placing the LA5 behind their support hand and operating the laser via the internal button or a pressure pad switch, placed where their support hand will not interrupt the IR laser. Suppressed MK18, again note right handed shooter has LA5 mounted behind support hand. 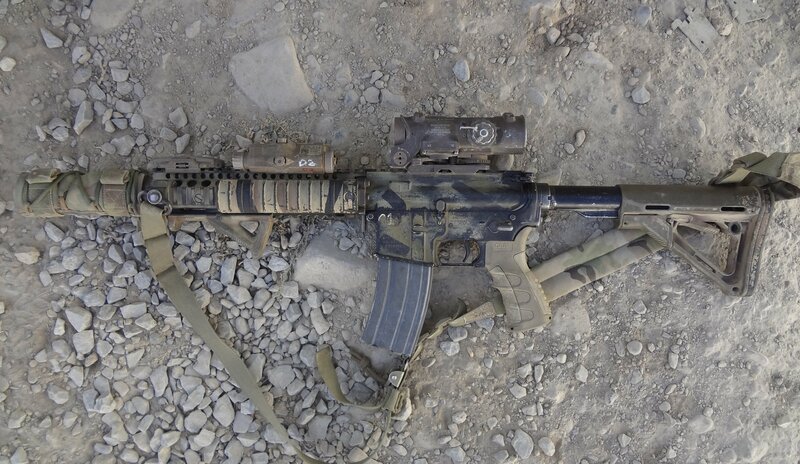 Accessories include Magpul AFG (Angled ForeGrip) and CTR stock, CAA pistol grip and a suppressor wrap. Rifle with the latest SOPMOD Block II forearm (minus front sight post cut out.) Notice aftermarket Magpul flip up rear sight and Hogue pistol grip. 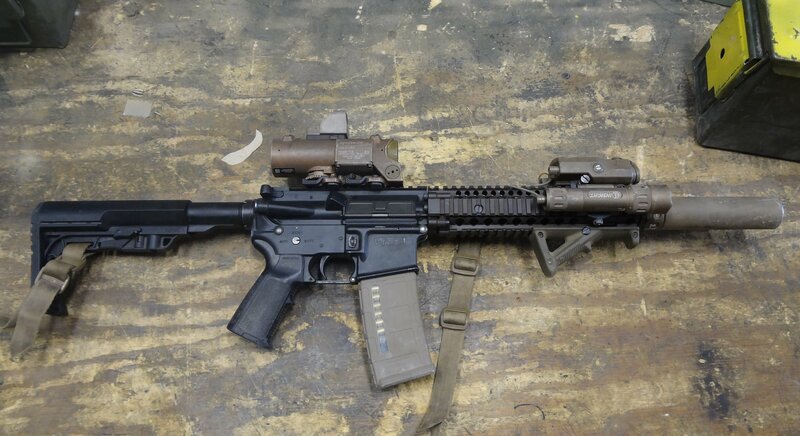 MK18 with Magpul grip and stock. Added to Magpul CTR stock LaRue Tactical Reciprocating Inline Stock Riser (RISR). Shooter prefers top mounted back-up EOTech MRDS on Elcan. Larue riser allows the height needed for proper cheek to stock fit. Same rifle as above, shooter started tour with a MFT Battlelink Minimalist Stock. 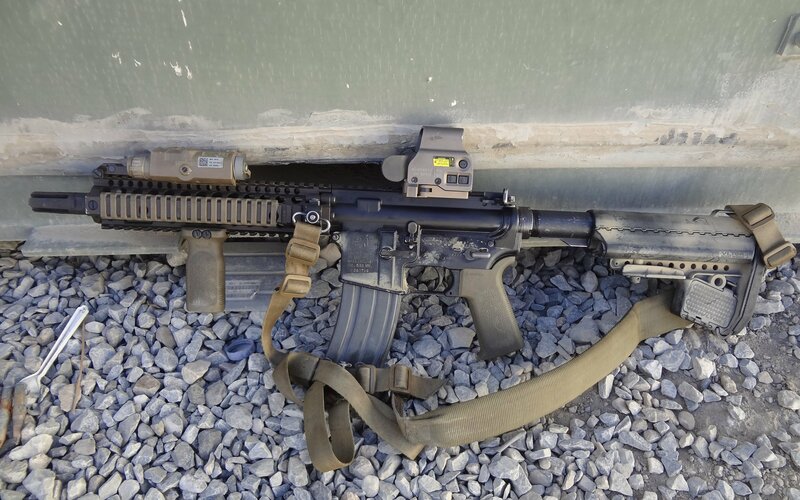 Fully Magpul-decked-out Mk18 (buttstock, pistol grip and hand stop.) Also note extended Magpul magazine. 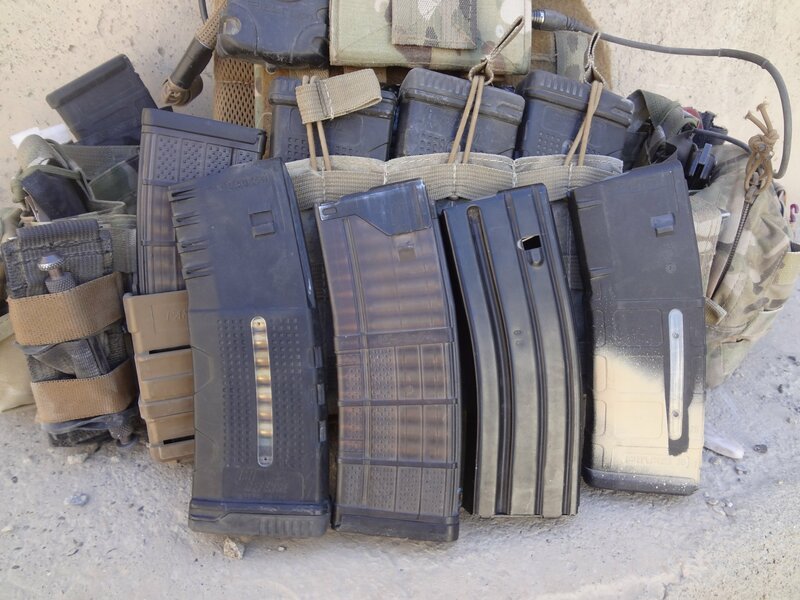 Not just for 3 gunners, extended magazines have proven reliable enough for combat use. Shorty with VLTOR buttstock and Magpul vertical and pistol grip. One thing you may have noticed with most of the rifles shown thus far is the lack of a full set of back-up iron sights (front and rear BUIS). 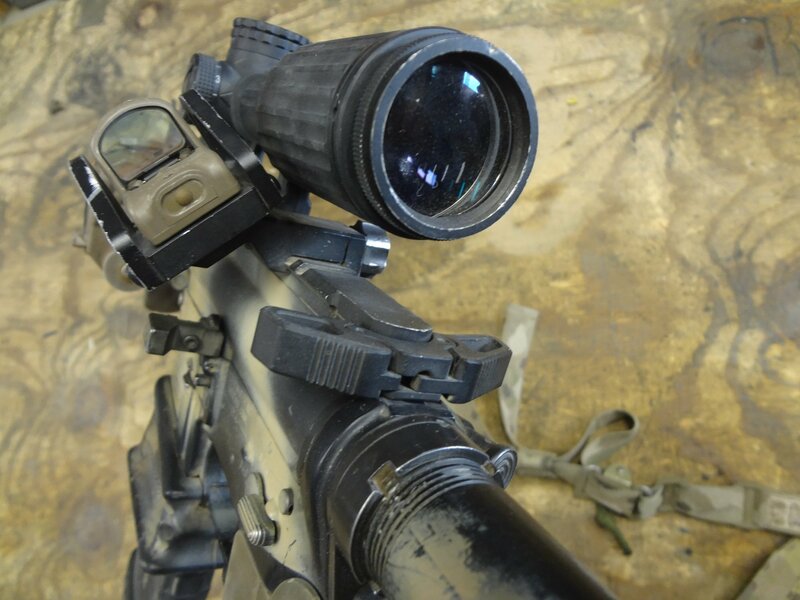 Despite what the “tactical experts” say about back up iron sights beeing a must on any tactical gun, a lot of soldiers, myself included, have had no issues with either red dots or magnified optics going down on them in combat. Is it a good idea to have a set of back-up irons on your rifle? Yes, but these guys are using their rifles in harm’s way rigged like they are. If anything, their choice to not run back up irons is a testament to the durability of the current issued optics. 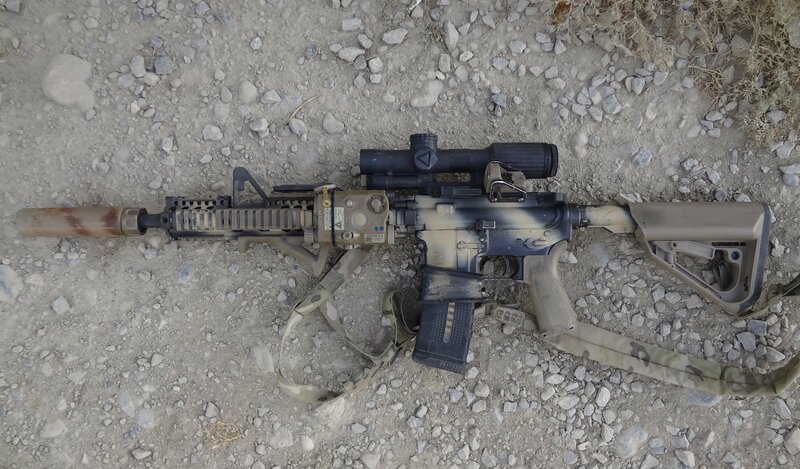 Note: My choice not to run BUIS on my rifle is based on the fact that I use a 45-degree-offset EOTech MRDS (Mini Red Dot Sight) on my rifles as my CQB back-up sight. This trip; aside from also choosing to opt for a Trijicon VCOG, my rifle started out the same as it was from last year’s deployment. MK18 with Magpul vertical fore grip, Ark Defense Enhanced SOPMOD Buttstock, BCM Gunfighter pistol grip, Arredondo extended magazine well, extended bolt catch, and an EOTech MRDS in a Matt Burkett Predator Tactical 45 degree mount. I did swap out BCMGunfighter Ambi charging Handle. for a AXTS/Rainer Arms Raptor Ambi Charging Handle, this trip. I should also point out my Blackhawk Night Ops Gladius tactical light (flashlight) from 2005 still going strong after four deployments! Author’s current set-up. About a month into the deployment I swapped out shorty 10.5 barrel for a 14.5. Although rifle a little on the front heavy side with the suppressor (and kind of a long set up.) The MK18 did not do the VCOG justice. 14.5 barrel produced ballistics that matched up almost perfectly with the 5.56 bullet drop compensating (BDC) reticle in the VCOG. With the average distances still around the 300-400 meter mark for engagements in Afghanistan. I wanted to give myself every possible advantage. What I see on my end of the rifle: Trijicon VCOG, backed up by MRDS in a Predator Tactical Offset Mount. Being a lefty an ambi-charging handle is a necessity, Raptor charging handle works great! The most prevalent aftermarket magazines being used are Magpul PMAG’s, specifically the older GEN M2 versions (PMAG 30 AR/M4 GEN M2 MOE 5.56X45MM NATO). Why specifically the older M2 version, and not the newer GEN M3’s? Years ago, thousands were purchased by units, so they are an issued item. Magazines; my top choice for 2015, from left to right: IMI Defense G2, Lancer L5 Advanced Warfighter, BCM and Magpul PMAG. One might look at this article and think it’s nothing really new from the previous pieces. This is true, but I think this is also a good thing. 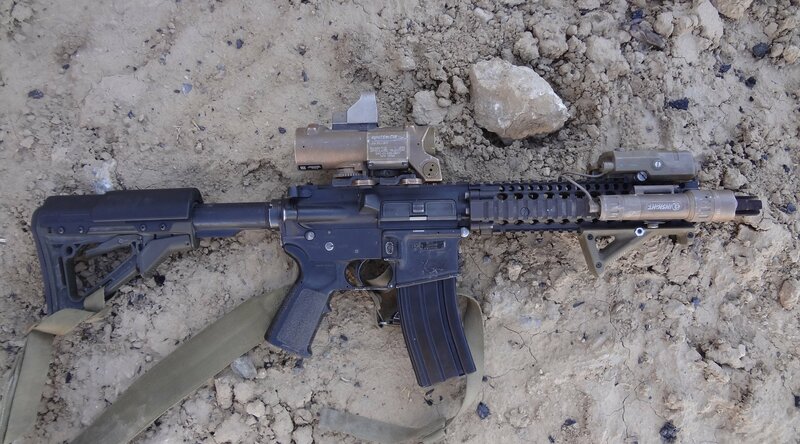 While they may not be the latest or the coolest things on the market, the tactical AR (AR-15/M4/M4A1) accessories being used have proven to be solid, and to meet the needs of the soldiers going into harm’s way with them–and that’s important. Title Pic; M4A1 Carbines and MK18 SBRs lined up on the wall. 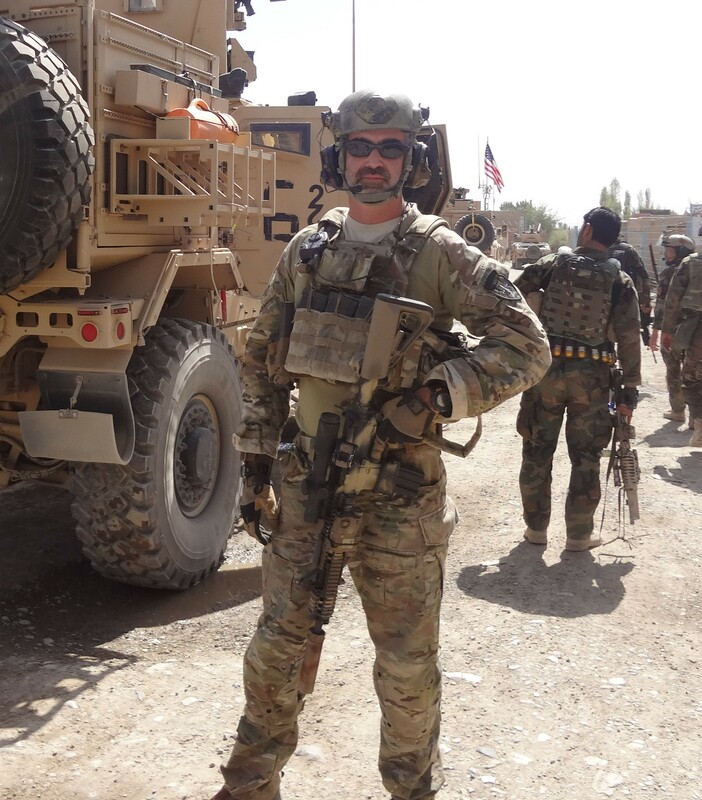 Jeff Gurwitch is currently serving in Afghanistan with the U.S Army. © Copyright 2016 DefenseReview.com and Jeff Gurwitch. All rights reserved. This material may not be published, broadcast, rewritten or redistributed without receiving permission and providing proper credit and appropriate links. Previous: Cobalt Kinetics Evolve 3-Gun Competition/Tactical AR-15 Rifle/Carbine/SBR with Cobalt Advantage Reload System (CARS) Magazine Auto-Eject/Bolt Carrier Group (BCG) Auto-Release Feature: Coming Soon to a Competition or Combat Theater Near You! Next: Arex AKB15 (or AKB-15) 7.62x39mm Tactical AK-Type Rifle/Carbine/SBR: Where the Modernized Kalashnikov AK-47/AKM Meets AR-15/ACR Modularity and Ergonomics!